Squeezing A Lot into a Little. This weekend has turned out to be pretty successful as far as productivity goes. 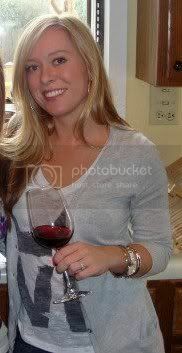 Friday night I decided to go out to the restaurant Killington’s and have a few draft beers with friends. Work was a little hectic over the week and a $2.75 Fat Tire was too tempting to miss out on. After blowing off some steam on Friday, I was up and ready to go early Saturday morning. I was on a mission to finally finish my save-the-dates so that they could be sent out on Monday. I’m happy to report after finalizing our guest list, compiling all our addresses, printing out our return labels and hand writing everyone’s personal envelope, we are DONE 🙂 No turning back now! 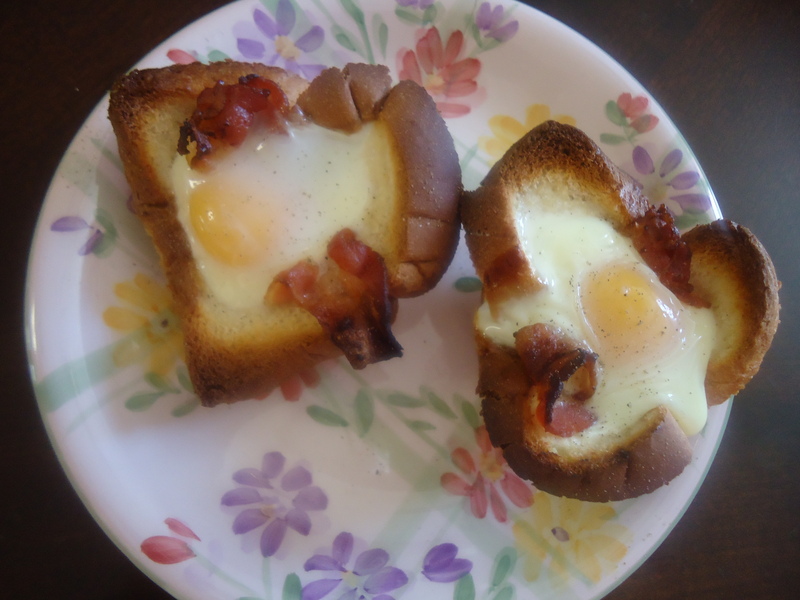 Before we got started on them I felt the need for a hearty breakfast for the long day ahead and I had been dying to make the bacon, egg and toast cups I had seen in a Martha Stewart magazine. I took a slight short-cut by not rolling the toast or cutting off the crusts. It was still very good but I think next time I will follow the directions, for no other reason than giving the bacon and egg more room in the baking sheet. Preheat oven to 375 degrees. Lightly butter 6 standard muffin cups. With a rolling-pin, flatten bread slices slightly and, with a 4 1/4 inch cookie cutter, cut into 8 rounds. Cut each round in half, then press 2 halves into each muffin cup, overlapping slightly and making sure bread comes up to the edge of the cup. Use extra bread to patch any gaps. Brush bread with remaining butter. In a large skillet, cook bacon over medium, until almost crisp, 4 minutes, flipping once. Lay 1 bacon slice in each bread cup and crack an egg over each. Season with salt and pepper. Bake until egg whites are just set, 20 to 25 minutes. run a small knife around cups to loosen toasts. Serve immediately. Saturday night, Chris and I decided to go see the new Ben Affleck movie, Town. It was really entertaining and it was nice to go so early in the evening to miss the crowds. After the movie I was in the mood to cook. I started tinkering around in the kitchen and with my weekly grocery ship on Sundays, there was slim pickin’s in the pantry and refrigerator. I realized I had salmon in the freezer that I never made last week and scrounged up just enough baby potatoes to complete a meal. I was happy to realize I could make “salmon skewers” and “smashed potatoes” from the same Martha Stewart magazine (love her!) 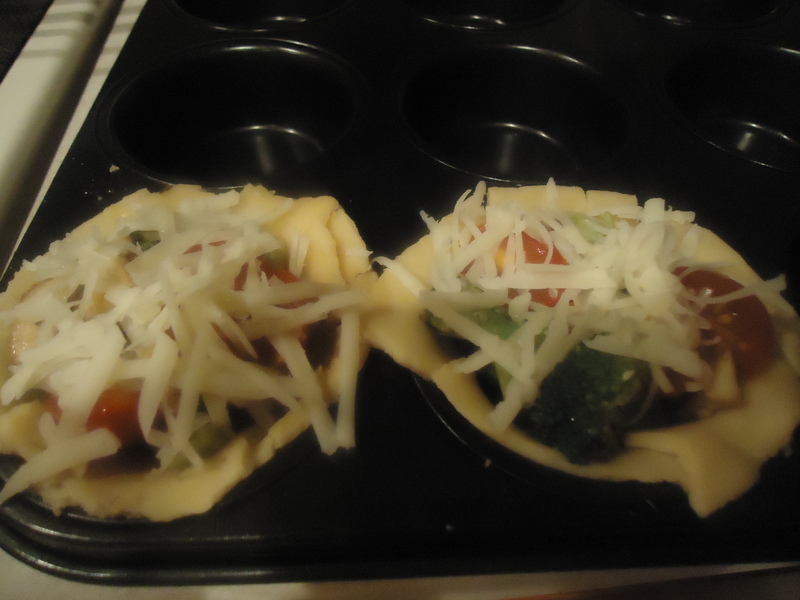 Knowing I could have left it at that, I really wanted to use the baking dish for some type of veggie tart. We only had a few mushrooms left over so I sautéed those along with some broccoli florets and some cherry tomatoes. Using a pie crust I used the same cookie cutter from earlier to make little tartlets. Heat broiler, with rack in top position. In a medium saucepan, bring potatoes to a boil in salted water and cook until tender when pierced with a knife, about 15 minutes. Meanwhile, thread 3 pieces salmon onto each of eight 6-inch wooden skewers. Place skewers in a single layer on a foil-lined rimmed baking sheet. Brush salmon with oil and season with salt and pepper. Fold foil over exposed areas of skewers to prevent burning. Drain potatoes. While still hot, gently smash each potato with the back of a spoon to flatten slightly and place, along with spinach and butter, in a large bowl. Season with salt and pepper, then toss to combine. 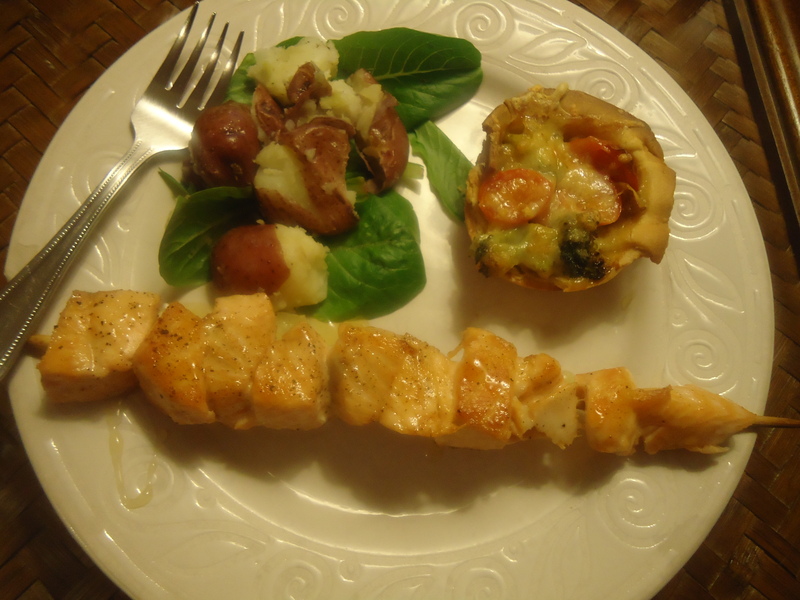 Serve salmon skewers with potatoes and spinach. 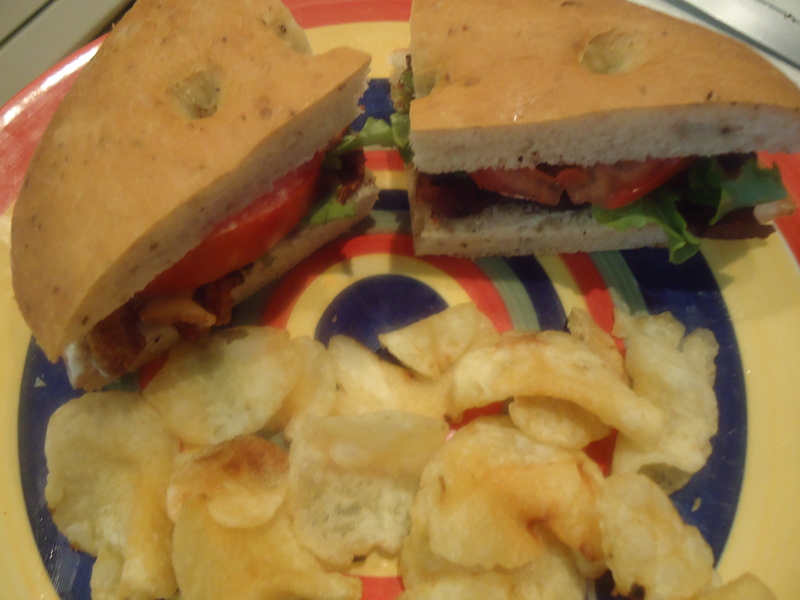 As good as this looked, I wasn’t feeling bacon twice in once weekend so I opted to go with a salad, mainly because I picked up some cranberry walnut Gorgonzola dressing that I was salivating over. This dressing made my salad like a dessert. 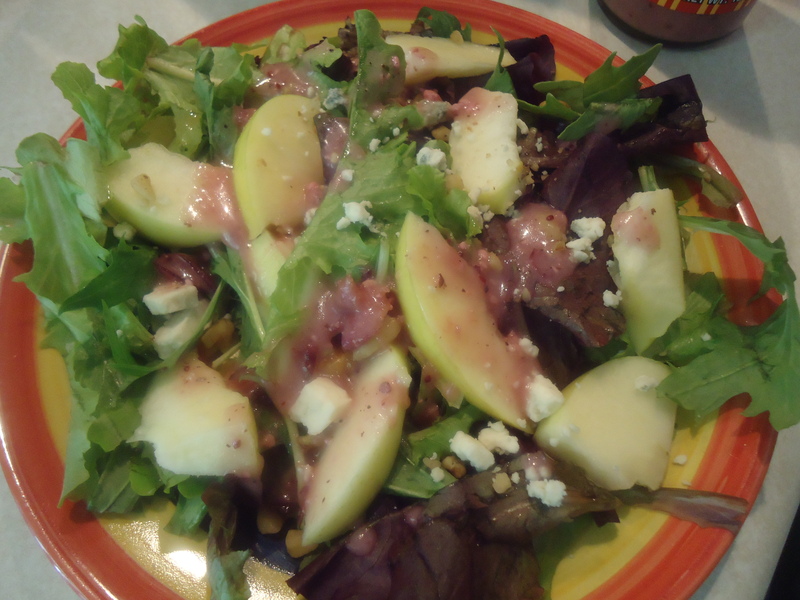 My salad included spring mix, blue cheese crumbles, walnuts and this dressing, and together, was a little slice of heaven! The weekend is coming to a close but I’m off to run 7 miles. Apart of me wishes I hadn’t waited till the last minute but it’s a beautiful day out and not to hot. I’m keeping my fingers crossed that I have fueled my body enough to handle the run and that it’s a positive one-Wish me Luck!